In the last 10 years of China’s history, there has been a mass increase in the number of skyscrapers in China’s major cities and financial hubs. This phenomenon has allowed for a number of cities in the Middle Kingdom to resemble cities such as New York and Frankfurt, and has become a distinct image of how China’s position as an economic power is growing and has become a country that’s development is relentless. Below, I will give a brief introduction to a few of the tallest buildings in China and show how a visit to these magnificent buildings can be simply fitted in to a China Holidays’ itinerary. When thinking of Chinese skylines, most people will automatically think of the postcard image of the Shanghai Pudong skyline which sits on the banks of the majestic Huangpu River. The Pudong skyline is home to not only the tallest building in China, but also home to some of the most iconic buildings in Eastern Asia. The tallest building in China is the Shanghai World Financial Centre which was completed in 2008. This towering skyscraper is made up of shopping centres, apartments and the Park Hyatt, Shanghai hotel. There is also a viewing deck at the top of the building which offers panoramic views of the city. The most distinct architectural component of the tower is the trapezoid aperture at the top of the tower which was designed to control wind pressure. 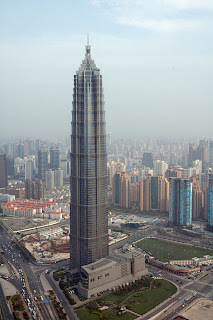 The World Financial Centre is located next to the Jin Mao Tower which was the previous tallest building in the PRC. Like the Petronas Towers in Malaysia, the Jin Mao tower has a distinct architectural style which mimics the tiered model of the majority of Asian pagodas. Though not as tall as the previously mentioned skyscrapers, one of the most iconic buildings in Shanghai, the Oriental Pearl Tower, which still stands at a whopping 470M, stands amongst Pudong’s other skyscrapers and really adds distinction to Shanghai’s spectacular skyline. China Holidays can offer tours to the Pudong section of Shanghai and organise for our clients to tour inside these towers. Furthermore, China Holidays’ clients can enjoy the view of the skyline from across the Huangpu River on the world-renowned Bund. Outside of Mainland China, both Taiwan and Hong Kong offer prime examples of Chinese skyscraper artistry. The Taipei 101 tower in Taipei is the tallest building in Taiwan standing at a mighty 510M. The Taipei 101, like the Jinmao Tower, was previously the official tallest building in the world until 2004. Like the Jinmao Tower further, the Taipei 101 has adopted the Pagoda trend into its architectural style and designed the building to be protected against typhoons and earthquakes which are prominent in Taiwan. In July 2011, the Taipei 101 was awarded certificate in its energy efficiency, and was named the tallest green building in the world. The Hong Kong skyline is as famous as the Shanghai skyline and has been expanded throughout the second half of the 20th century. One of the most famous structures in Hong Kong is the Bank of China Tower which is located on Hong Kong Island. The structure of the building is supposed to represent growing bamboo shoots, which is a symbol in Chinese culture of prosperity and longevity. Like many buildings throughout China, the structure and architectural style of the Bank of China Tower applies the ancient Chinese philosophy of Fengshui, which brings peace and prosperity to its structures. The Hong Kong skyline now brings in many additional tourists through its nightly ‘A Symphony of Lights’ show which sees many buildings lighting up to timed music. This show has been added to the Guinness Book of World Records as the largest permanent light and sound show in the world. If you are interested in seeing the Taipei 101 tower in Taiwan, why not check out China Holidays’ ‘Taiwan’ Tour which covers an extensive visit of the unique island. Many of our tours at China Holidays offer extensions to Hong Kong and it is easy no matter where you are in Central Hong Kong to see the city’s immense skyline. Skyscraper culture in China is on the increase all the time with more and more apartments, hotels, shopping areas and offices being built every day. Shanghai will continue to lead in height with the addition of the new Shanghai Tower which will be completed by 2014 and stand at a height of 632M.